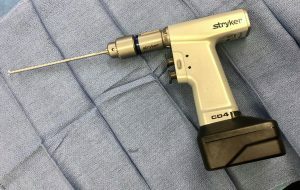 How do we accurately place screws in the knee and shoulder joints when we are using an arthroscope or even in some open surgeries? We use a technique called cannulation. A guide pin, which is quite small and commonly around 3 mm in diameter or smaller, is placed. If the guide pin is not in a perfect position it is not a big issue to readjust the guide pin and make a second entry side into the bone. Then we use the appropriate size drill over the guide pin. So the drill is hollow therefore the guide pin can fit through the drill. After the drill is removed from the bone, the guide pin is left in the bone. The screw is also cannulated or is hollow. The screw gets placed over the guide pin, the cannulated screwdriver is seated into the screw head, and the screw is placed. 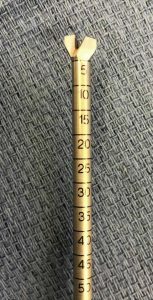 This allows accurate placement within the bone. The drill bits are also marked with measurements so we know how deep the drill is going into the bone.